This composite image shows the central regions of the nearby Circinus galaxy, located about 12 million light years away. Data from NASA’s Chandra X-ray Observatory is shown in blue and data from the Hubble Space telescope is shown in yellow, red, cyan, and light blue. It's relatively easy for galaxies to make stars. Start out with a bunch of random blobs of gas and dust. Typically those blobs will be pretty warm. To turn them into stars, you have to cool them off. By dumping all their heat in the form of radiation, they can compress. Dump more heat, compress more. Repeat for a million years or so. When we observe massive galaxies, we see enormous amounts of X-ray radiation blasting away from their cores. This radiation naturally carries away heat. 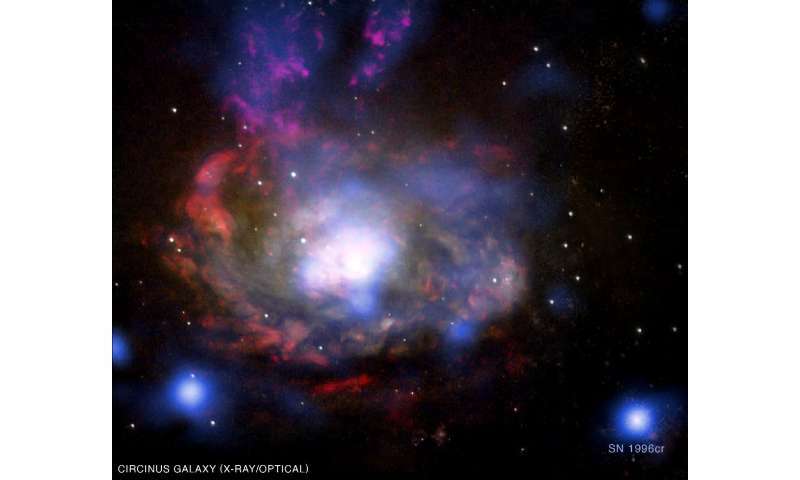 This radiation naturally cools down the galaxies, especially in their cores. So, the gas in the core should be compressing and shrinking in volume. The surrounding material should take notice and fall in down behind it, funneling itself into the core. And not just a little bit: as much as thousand solar masses per year ought to be collapsing into the cores of the most massive galaxies as they cool, cool, cool. This enormous cooling and compressing should, by all rights, trigger massive amounts of star formation. After all, you have exactly the right conditions: lots of stuff cooled down into tiny little pockets. So in these galaxies with loads of X-ray output, we ought to be seeing tons of new stars popping out. Something has to keep these galaxies warm despite the major loss of heat from their X-ray emission. Something has to stop the gas from compressing all the way down to manufacture stars. Something has to keep the starlights turned down low. As with most mysteries in astronomy, there are various ideas, all with their own strengths and weaknesses, and none of them entirely satisfactory. The variety of mechanisms used to explain this conundrum include supernova feedback, powerful shock waves blown out by massive stars, magnetic fields going haywire, and even altering the very shape of the galaxy to prevent further cooling. Perhaps the easiest things to blame are the supermassive black holes that sit in the center of the galaxies. As the gas cools and flows inwards, it draws itself to the black hole. The massive sucking vortex of gravity hungrily feeds off the gas, driving it further down. But with all that gas compressing into such a small volume, it heats up, tremendously. 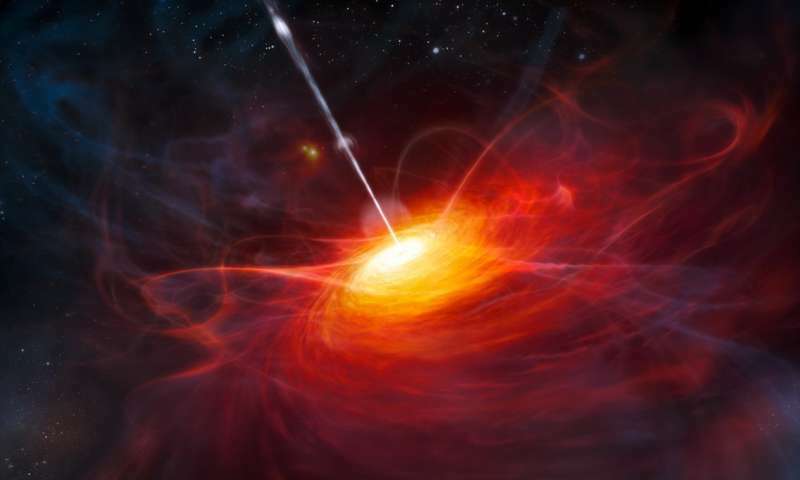 Sometimes, if the mix of strong magnetic forces are just right, streams of gas can wheel around the black hole, barely avoiding oblivion beneath the event horizon, wind and swirl around, eventually blasting out of the region in the form of a long, thin jet. This jet carries a lot of energy. Enough energy to heat up the entire core of the galaxy, preventing further cooling. If that's not good enough, the extreme radiation emitted by the intense hot gas as it gets shoved down the gullet of the black hole can blast away at its surroundings, providing more than enough heat to halt – and even reverse – the flows of cool gas. This scenario is definitely appealing, because it's a) really common and b) really powerful. At first glance it's a perfect clincher, but nature, as usual, as a habit of turning nasty. The trouble is that feeding black holes are fantastically complicated systems, with all sorts of physical processes mixing together, which makes them hard to study. And, wouldn't you know it, when we try to simulate these scenarios on a computer, following the physics as best we can and as best understand, we have a lot of trouble getting the right amounts of energy into the right places. Sometimes the galaxies just keep on cooling. Sometimes they blow up. Sometime they fluctuate back and forth between heating and cooling too rapidly. While we don't have a full and final picture yet, researchers are making steady, if slow, progress in understanding the relationship between giant black holes and their host galaxies. In a recent paper, scientists used advanced computer simulations to try to examine that full picture, including as much of the detailed physics as possible. They found that when it comes to these fantastic processes featuring nature's awesome raw power at its rawest, subtleties matter. Sure, the intense radiation given off by the infalling gas and the jets escaping from near the deathly surface of the black holes play a role in regulating the temperatures of galaxies. But they often fail, misapplying their energies into the wrong places or the wrong times. But radiation and jets aren't the only things driven by the central supermassive black holes. Cosmic rays, tiny charged particles traveling close to the speed of light, flood the vicinity of the maelstrom. They help transport heat at a nice even, steady pace, keeping the heartbeat of the galaxy going at a regular rhythm. Plus there's good old-fashioned turbulence, with rolling shock waves and general bad temperament driven by the flare-ups in the center. This turbulence does just a fine job at preventing surrounding gas from cooling completely and bursting into star formation. So is this it, the complete story? Of course not. Galaxies are living, breathing creatures, with massive engines of gravity driving their hearts, and intertwined flows of gas shaped by powerful – and sometimes exotic – forces. It's a tough problem to study, but a fascinating one, since by pinning down the relationship between galaxies and their black holes, as communicated through the flows and disruptions of cool gas, we can try to unlock the story of galaxy evolution itself.